For months, sounds of construction surrounded the Nashville Sounds’ sparkling new First Tennessee Park in Germantown. The constant thump-thump-thump of pounding jackhammers competed with the irritating, high-pitched beeps of vehicles backing up. Ka-ching! Cranes lifted steel beams into place, keeping time with a syncopated thrumming of never-ending drilling. Ka-ching! The chugs of a Sod Installer Roller laying grass over dirt in the infield, the outfield and on the berm behind the left-centerfield wall. Ka-ching! A foreman’s shouted instructions to laborers on where this or that goes. Ka-ching! Now the prominent sound is of ringing of cash registers – Ka-ching! – as baseball returns to its Music City roots, and redevelopment of this historic North Nashville neighborhood hits the stratosphere. 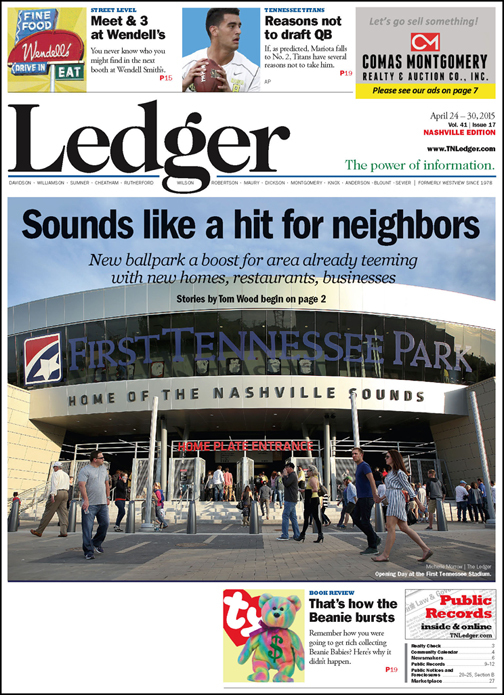 Since April 17 – when the Nashville Sounds opened their new home – one hears resonances of children squealing and parents oohing and ahhing at the lush greenery and shiny magnificence of this 10,000-seat facility at the historic Sulphur Dell site, of vendors shouting “getcha co-o-old beer here,” of the singing of the national anthem and the umpire’s throaty shout of “Play ball!” followed by cheers, boos and postgame fireworks. Throughout the Germantown area, there are ka-chinging peals of thriving businesses as people pour into the area to watch the Sounds, of moving vans delivering the belongings of new residents, of people heading to this North Nashville hotspot to eat, drink and be merry. And while officials say it’s too early to estimate the future economic impact of the Sounds’ stadium on the neighborhood, it is obviously going to be huge. There are currently some 25 restaurants in Germantown with many more restaurant and real estate development projects planned. At least 1,600 residences are being added with homes, apartments and condominiums, and more than 1,100 units are zoned for mixed use. The Sounds also plan their own real estate project adjacent to the stadium. The stadium itself cost $75 million to build – $10 million over the projected costs – and it will serve as a bridge between downtown Nashville and one of its oldest neighborhoods. 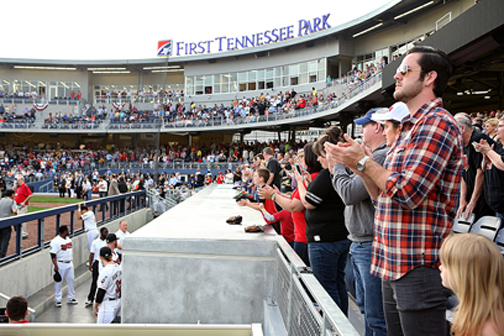 A crowd fills the stands on opening night of First Tennessee Park, home of The Nashville Sounds. “This ballpark isn’t just about baseball, it’s about celebrating our history, it’s about adding to the economy of this part of our city,” says Mayor Karl Dean, who pushed and prodded the Sounds into building at the same historic site as the city’s first baseball park, Sulphur Dell. “Ever since I started saying the city should build a stadium on this site, I said it would bring economic development to North Nashville and the Jefferson Street area. It’s doing exactly that. Indeed, the game is changing for this already thriving community, and most neighbors welcome the team’s arrival. “Without a doubt, the Sounds stadium is going to spur economic development in Germantown,” says Matt Bodnar, a partner with Fresh Hospitality, whose company has two ongoing development projects near the stadium that will house Cochon Butcher, Little Donkey Mexican restaurant and Octane juice bar, and an as-yet-unnamed concept restaurant. “We’re investing in the neighborhood as a whole. But I also think there’s been a tremendous amount of development,” Bodnar adds. “One of the strongest backbones that we’re kind of betting on is residential multi-family apartment and condominium buildings in and around Germantown. The RealTracs website lists 42 residences in the Salemtown/Germantown area topping $200,000, with 31 listings at more than $300,000. The most expensive listing is near Monell’s Restaurant in the heart of Germantown, a historic home on 6th Ave. N., lists for $925,000. A condo in the Luxus Germantown development sold for $1.08 million last week, a new record for the area. “No one had ever heard of Salemtown, thinking it a place where they burn witches. Now it is a place for developers to burn money,” explains realtor Richard Courtney of Christianson, Patterson, Courtney and Assoc. n In 2012, there were nine single-family homes sold in Germantown. 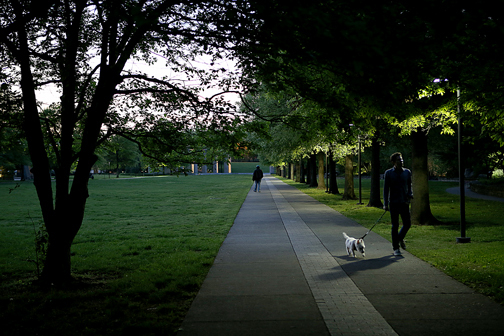 While baseball fans were taking in opening night at First Tennessee Park, others were out for a stroll nearby at the Bicentennial Capital Mall State Park. n That number jumped to 45 and 44 in 2013 and 2014, respectively, with the only factor slowing sales being the availability of lots. “And, for the record, there is no end in sight,” Courtney says. It remains to be seen just how much more the real estate market can bear, but what is undeniable is the overall impact of the Sounds’ stadium. “The ballpark is a $75 million civic investment in the middle of the Sulphur Dell neighborhood. The economic impact should be tremendous,” says Chad Grout, a commercial real estate broker who focuses on the Germantown neighborhood, among others. “To be sure, I would expect the economic impact of a $75 million baseball stadium to be tremendous no matter where it was built,’’ he adds. Grout’s firm Urban Grout spearheaded The Warehouse project at 5th & Taylor in Germantown. Rich Riebling, Metro’s director of finance, explains: “We thought it would be a catalyst for redevelopment, and it has literally exploded. “I’ve tried to put together some [economic impact] numbers,’’ he adds. “We have a chart that shows the number of current development projects. I asked them if they had a dollar number for those projects, and they don’t. 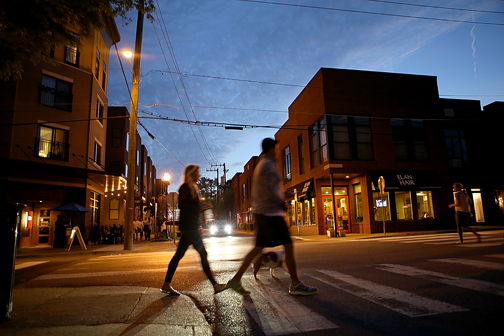 As twilight settles over the neighborhoods around the First Tennessee Park, patrons are out on the town near Germantown Cafe and Silo at 5th Ave and Madison. Riebling is talking about the Salemtown Cottages, a new Craftsman-style neighborhood with 24 three-bedroom homes ranging from 1,450 to 1,750 square feet priced at $325,000. The nearby Salemtown Square project is six homes – three of which have already sold with no marketing. One listing was for $393,500. “Clearly, there’s a gigantic boom in the Germantown/Salemtown area,’’ says Toby Compton, director of the Metropolitan Sports Authority. “We think this will be a nice anchor for Jefferson Street. So we hope that development continues up Jefferson Street, and it clearly moves our downtown north. It’s hard to put a dollar number on the stadium’s direct economic impact on the Germantown area, because “we have no historical data,” says Butch Spyridon, president and CEO of the Nashville Convention and Visitors Corporation. “We have not [come up with a figure for direct economic impact], as much because it’s a new game in town, a new facility and a new affiliate. Spyridon’s marketing efforts will extend well beyond the Davidson County line – all the way to Oakland, California. This season, the Oakland Athletics replaced the Milwaukee Brewers as parent club of the Class AAA Sounds. On June 7, Southwest Airlines restores direct flights between Nashville and Oakland. Mayor Dean is set to be on the inaugural flight. So Bay Area fans can spend a week at the CMA Music Festival or Bonnaroo, then check out their future stars. The Farmers’ Market and surrounding businesses stand to benefit from the new ball park and its fans. Here’s a historical tidbit about Oakland’s original Nashville connection. The city was co-founded by John Coffee Hays, a native of Cedar Lick in Wilson County. Hays left Tennessee at age 15 and became a leader of the famed Texas Rangers (the law enforcement organization, not the baseball team). Michael King is the owner of Monell’s, which at age 25 is the second-oldest restaurant behind the Germantown landmark The Mad Platter. King says the Sounds’ stadium project only boosts Germantown’s ongoing growth spurt, but he does have a concern – parking. He’s not alone. It’s an issue that concerns all involved, especially since the state-owned parking garage will not be completed until after the Sounds’ inaugural season at First Tennessee Park. “I think it’s exciting about the ballpark,’’ says King, who serves about 10,000 family-style meals a month at his Germantown location at 1213 6th Ave. N.
“It’s definitely going to change the scope. I think change is good. “As a business [owner], I’m grateful because it will bring a lot of business here, and it brings lot of traffic. [The concern is] how do you balance that growth with allowing the neighbors to get their car in their house,’’ he adds. Mayor Dean, Sounds officials and other city planners are actively urging fans NOT to park north of Jefferson Street. There are free connector buses circulating before and after the game, parking is available for $5 at the Metro Courthouse underground garage, and Compton says 6,000 parking spaces have been identified for game use. 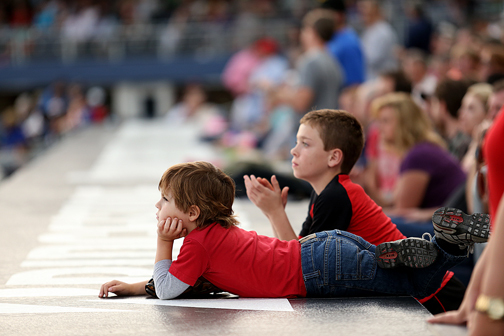 Young fans await the first pitch during opening night at First Tennessee Park. Other Germantown business owners say parking was an issue before the Sounds’ arrival, and they welcome the influx of new customers. Mignon Francois, owner of Cupcake Collection at 1213 6th Ave. N., has lived in Germantown 11 years and has had her business there six years. “I am ecstatic about having the Sounds come to this side of town. I think it’s a wonderful use of the space, a wonderful homage to what was there before, the history of the city, and I think it deserves to come back to that,” says Francois. “I’m nervous about the parking, I can say that. I’m nervous about the fact that we live and work here, and sometimes it’s tough to get into your own house with a bag of groceries, and that can be quite frustrating. Staci Bockman’s family owns 312 Pizza Company, located at 371 Monroe Street and co-owns Tempur Chocolate Shoppe, 1201 5th Ave. N. She predicts the Sounds’ arrival will “liven up” the whole neighborhood, and the city’s parking plan can work if everyone cooperates. “There’s so much redevelopment going on and revitalization in the Germantown area, that to bring a sports team here will fill a gap between here and downtown,” Bockman explains. There is some parking available just a few blocks from the stadium at the Farmers’ Market at Bicentennial Mall after businesses close. Most days that is around 4 p.m., but Tasha Kennard, executive director of Nashville Farmer’s Market, says Marketplace restaurants and businesses are now open until 8 p.m. on Fridays and Saturdays, to capitalize on crowds drawn to the Sounds games. “It’s nice to see this area of town revitalized,’’ she says. “We’ve been in this facility for 20 years, and there’s a whole different vibe about what this area is going to look like this summer. She envisions a fan-friendly Farmers’ Market, where people will come enjoy a pregame meal or beverage, then walk to the stadium. Kennard says players and the Sounds’ mascot will make regular appearances in a neighborly, cross-promotional sort of way. Among the new food vendors inside the Marketplace are The Picnic Tap, which features a line of craft beers, as well as Jeni’s Splendid Ice Creams. Also new to the lineup are Batch Nashville gifts and Village Bakery and Provisions. Kennard points out there are only 340 parking spaces at Farmers’ Market. “It’s going to be hard on all the businesses in this community for the first couple of months,” she admits. “If [fans] want to come here and get a barbecue sandwich and a cold drink before the ballgame, fantastic. We’re clearly walkable from Farmers’ Market to the stadium. “One of the concerns is that we don’t want to become the free parking destination to Sounds games, and then people who are coming here to eat don’t have a place to park. We need to be good neighbors. Germantown resident Michael Emrick, an architect who does historical preservation work, has lived in Germantown since 1979. Berdelle Campbell, who will turn 88 in June, has been there almost as long. Both know the neighborhood’s history, how much it has changed and have concerns about the future for the Historic Register neighborhood. Both cautiously welcome the Sounds to the community. “I don’t have any problem with it, if it helps fill in what’s happening down there,” says Emrick. “It’s putting development pressure on this area and the surrounding neighborhood more quickly and more densely than [anticipated]. Campbell remembers when she and her late husband, Ernest, moved to the dilapidated neighborhood in 1980 or ’81 after selling their Belle Meade home. She and neighbors fought for many changes [they were the originators of mixed use zoning ordinances] in the neighborhood – and against others. One battle even got her and neighbors arrested. The city wanted to put an auto emissions testing facility directly across from Campbell’s house, and the neighbors banded together to fight it, forming picket lines and protesting. Four of them went to jail for blocking the bulldozer. “The company president flew in from Texas, New Mexico or wherever, bringing his rolled-up architectural plans and thinking he was dealing with a bunch of hillbillies,” she recalls. She and Emrick will keep an eye on the neighborhood’s direction and aren’t afraid to call public attention to problems when the need arises. But she’s planning to go see a Sounds game this summer, even though she preferred the old thermal plant site just south of Broadway near the Cumberland River for the new stadium. “I didn’t actively fight it, but I didn’t sanction it,” she says. “I don’t think of it as in conflict, but the growth pattern of Germantown has taken on a life of its own. Mayor Dean will also keep an eye on the area’s future growth, long after he’s out of office. “I think it’s going to be a lot of residential, even more than it already is, Dean notes. 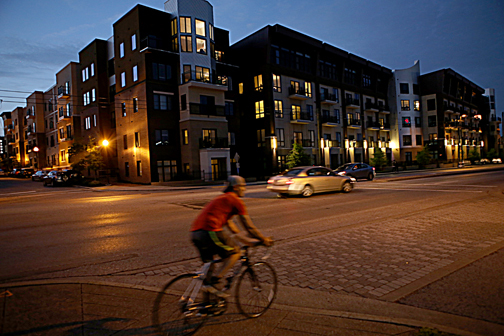 “It’s one of the fastest-growing residential areas of the city. “It’s going to a prime place for retail, maybe some restaurants. But it’s going to be an exciting place to live.